Become the Funnest Girl in the world!! Disclosure: this post is sponsored by Garnier and Style Coalition. I have tried the product and all opinions are my own. 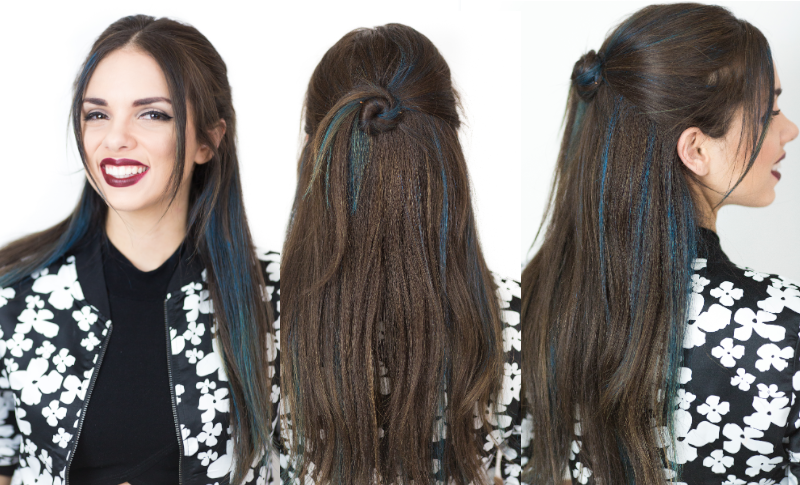 I’ve been having so much fun with GarnierColor Styler…as you can see above, I’ve had blue ombré, mermaid hair, and now fun blue streaks. With the 5 bold shades to try…the fun color combos are endless. Next fun color combo? I definitely want to play with “Purple Mania” and “Pink Pop”. No matter where I went with my fun colored hair… I always got the best compliments. I really felt like the funnest and coolest girl in town (or should I say the world!!?). So the big question is….HOW DO YOU BECOME THE FUNNEST GIRL IN THE WORLD? Forget about what people might think…be yourself and never apologize for being who YOU are. Be positive…always look on the bright side of things. SMILE…SMILE A LOT!!! The way you dress and style your hair should be an extension of your personality. Try a fashion trend you love, wear a different lipstick, add color to your hair for the weekend!! And the best part is that right now Garnier Color Styler is looking for The Funnest Girl in the World to be their 72 hour spokesmodel. If you want the title all you have to do is try your own Color Styler look, snap a SUPA’ DUPA’ fun selfie, tell us why you’re the Funnest Girl in the World in the caption, and post it on Instagram using the hashtag #FunnestGirl! You can also visit www.garnierusa.com/funnestgirl for more info. GOOD LUCK!! ¡Hola chicas! Como se han podido dar cuenta, me he estado divirtiendo con Garnier Color Styler- he tenido el cabello aqua, con mechones azules, ombré de colores, y más. Al ser 5 colores temporales, los toques de color son infinitos. También quiero probar el tono lavanda llamado "Purple Mania" junto al rosado "Pink Pop". También las invito a ver mi video en español de como usar este producto y como lograr una media cola con mechones azules..
La gran pregunta es.. ¿COMO CONVERTIRSE EN LA CHICA MAS DIVERTIDA DEL MUNDO? Primero que nada, empieza olvidando lo que la gente dirá…se tu misma y nunca te disculpes con nadie por ser quien eres. Piensa positivo…vele el lado positivo a todo y sonriele a la vida. ¡SONRIE SIEMPRE! ¡Baila, canta, ama.. y vive cada momento!! Ahora la mejor parte es que Garnier Color Styler está buscando a las chicas más divertidas del mundo y tu puedes ser una de ellas y ser la imagen de Garnier por 72 horas. Si quieres este increíble título, solo debes probar un color divertido con el Color Styler, tomarte una selfie y subirla a instagram usando el hashtag #Funnestgirl. También puedes visitar www.garnierusa.com/funnestgirl para más información. ¡SUERTE!! I'm gonna get my wife to follow this. I'd love to see her in some of this fashion. Great Job!